Whenever we come across a beautiful piece, be it a poem or a short story or any literary work, we have tried with our best intentions to bring it in the forefront, to readers like you who love to get inspired and the creators love to get their confidence boasted by your response. Our world, the bookworm’s world cannot be complete if a writer or a poet decides not to sit down for those odd, long patienceless hours to create beautiful, diverse and magical worlds for us. 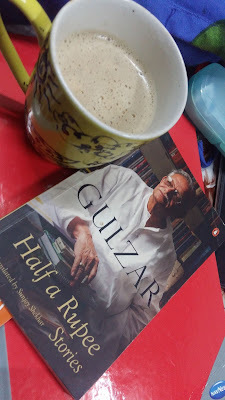 It is only by reading such books our never satisfied thirst for knowing the writer’s world ever increases, and our minds, our thoughts, our way of looking at life at large revolves around the creators alone. In a way we seem to forget our worries and get drawn in their characters, their feelings and the touch of an inspiring narrative. Poetry is one such piece which has for ages tried to convey to us the truth of our existence and it has succeeded in surviving the electronic age because the written words can never disappear. It is like that love affair which always resurrects the mechanical souls again and again. 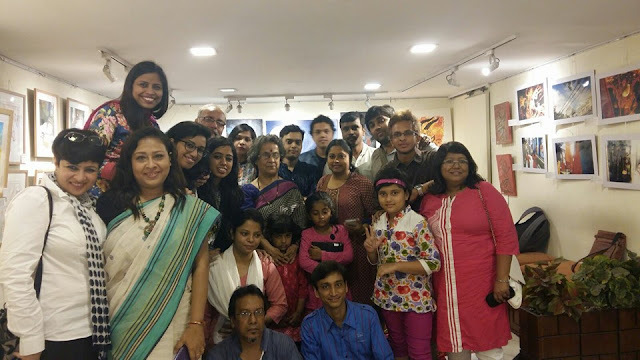 Being Bookworms couldn’t miss the Poetry book launch of Ananya Chatterjee, and Shruti Goswami’s “Another Soliloquy” published by Shambhabi- The Third Eye Imprint in Starmark on the 31st Oct ’14 evening so efficiently organized by AHAVA Communication, the brain child of Mona Sen Gupta and Sushruto Sarakar. It was an evening full of surprises for everyone; Starmark was packed with curious spectators, writers and wishful poets to hear the esteemed panelist present to encourage the poetesses. The book launch was to be followed up by a musical poetry session by Sumit Roy known as the king of Calypso, the title rightfully earned for his musical collaborating with Usha Uthup, a musician and a prolific composer was present to lend his powerful voice and music during the narration of the poems by Shruti and Ananya at the launch. The esteemed panelist Ashok Vishwanathan, a National Award Filmmaker, Actor, Charles Wallace Scholar, President of Eastern India Film Festival and he has directed more than 150 films and television projects along with nine feature films five of which was included in the International Film Festival of India. Chor,Hirma ki amar Kahani to name a few and had been the Chief Editor of Seagull Books(1987-2006). And Dr Kiriti Sengupta, Demonstrator at West Bengal and co-owner of Shambhabi publishers. He is a bilingual poet and translator in both Bengali and English. He is the author of the bestselling title, My Glass Of Wine, a novelette based on autobiographic poetry. Kiriti’s other works include: My Dazzling Bards (literary critique), The Reciting Pens (interviews of three published Bengali poets along with translations of a few of their poems), The Unheard I (literary nonfiction), Desirous Water (poems by Sumita Nandy, contributed as the translator), Poem Continuous – Reincarnated Expressions(poems by Bibhas Roy Chowdhury, contributed as the translator), and Aay Na (Bengali free verses). Kiriti Sengupta is also a proud member of the Inner Child Press limited (U.S.A.). were excited to ask our poetesses their journey as poets and the book Another Soliloquy’s journey. The book was launched with thunderous applause from the packed audiences in Starmark by the guests of honour, Anjum Katyal ,Ashok Viswanathan,Ananya Chatterjee, Shruti Goswami, Dr Kiriti Sengupta and Probir Roy of Shambhabi Publishers and Tomojit Bhattacharya the cover designer of Another Soliloquy book. And this encounter with him inspired her to write one of the poems in her second book, Another Soliloquy. When asked how she captured intense emotions like love and freedom in her poetry ‘The Release’ by Anjum, Shruti shared an experience with the audience. One of her poems revolving around the freedom theme in Another Soliloquy was actually based on a graphic, a chained butterfly image on which she as a participating poet in a radio show competition had to write on. Ashok Viswanathan loved the elements of poetry; to him poetry is a combination of music, metaphor and milieu. He rightly pointed out that Shruti Goswami, an architect by profession had her architecture rich in love and the latter, Ananya Chatterjee, a software professional and translator had given us a narrative based on an autobiographical interlude. Ashok like many of us wanted to know how important is musicality, prosody or blank verse for a poem to be really recognized as poetry? To this Anjum delightfully answered “I think it is really central to poetry and when you are moving away from meter and tackling black verse that’s where the rhythm has to be internal and subtle as poetry is about hearing it too. Dr Kiriti Sengupta was as Ashok pointed out moved by the agony which is often seen in some of the poems of Ananya. Ashok asked Kiriti what he thought about prosody or rhythm helping to bring forth the agony in poetry. When Shruti read Ananya’s poem “Hush…” for the audience, we were deeply touched by its simplicity and the subject it dealt with. Ananya then went on explaining that Hush was based on child abuse. The child when grows up builds a dislike for scones and pukes at the site of teddies, no one wants to know the reason for such a behavior, to look real deep into this antipathy. Anjum felt that Ananya in ‘Hush’ was imposing some restrain on agony and we all wanted to know if it was a conscious choice or it came out like that. To this she exclaimed that it came out like that and she used simple words purposely to show how the abuser was coaxing the abused child. Ananya read out Dream…one of the poems of that she loves of Shruti in Another Soliloquy and we were could actually see what the picturesque poem was showing. "Often stressing that her lines speak for themselves….. I had started to miss even before I left them." - her lines speaks for herself...this is Shruti Goswami as a poet to us. When Ashok writes his poetry he doesn't design the entire poem but one line follows the other and his poetry takes shape. After hearing Shruti’s poetry he wanted to know her creative process or her way of going about poetry in all like many of us. She exclaimed about her spontaneous method, some incident, some idea, a book or a movie, any inspiration makes the poem happen for her. Whatever she sees she gets deeply affected and in a process of release it comes out naturally. But this was not it; we were desperately waiting to hear Sumit Roy lend his voice as the two poetesses read out their loved poems. It was such a magical experience. His deep effective voice was really giving what a poem needs, our attention. We loved the entire process so much. I could see happy, satisfied, inspired faces in the crowd talking to the poets and the panelists to know more about poetry. Some got their answers, some thought of taking their notebooks and write their first poem, some just waited to analyze what they had just witnessed, some were on could nine to having witnessed a poets world. In the end a lovely collection of poems, two lovely poets and the readers were united. The books flew of the shelf’s, a beaming young poet standing in the line to get it signed by Ananya and Shruti, the proud publishers Probir and Kiriti Sengupta observing the rush, the enthusiasm, the fulfillment of their hard work, the passionate, calm and happy organizers Mona Sen Gupta and Sushroota Sarkar from AHAVA Communications smiling ear to ear seeing everyone gathered around and congratulating them. And Being Bookworms happy to have seen two talented poets take their first step into our world and expecting great works in future from them. We congratulate the entire team for giving this wonderful book of poems, Another Soliloquy to us and we initiate our budding poets to read this beautiful piece and write and our readers to read and get inspired. We hope to hear from you all about how you felt about this article and share your experiences with poems…tell us which poet left you mesmerized and do keep reading that love called books.